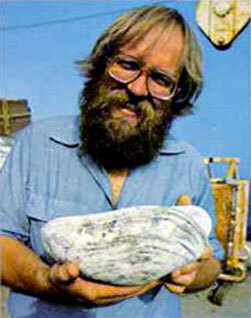 The San Francisco Chronicle published David Perlman’s exclusive stories about the Galápagos vent discoveries in 1977. 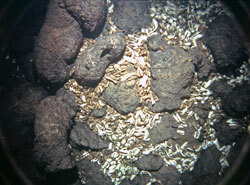 The Southtow and Pleiades expeditions had identified the Galápagos Rift as a prime locale to find hydrothermal vents. 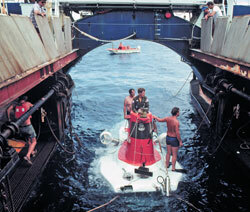 Project FAMOUS had proved the ability of submersibles to explore mid-ocean ridges. It was time to take Alvin to the Galapágos. 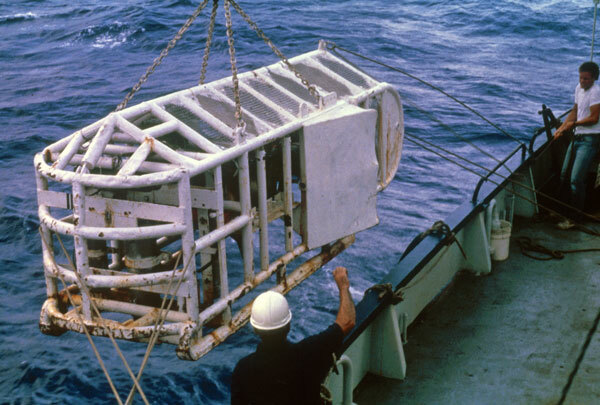 The Galápagos Hydrothermal Expedition, funded by the National Science Foundation, began on Feb. 8, 1977, with Woods Hole’s R/V Knorr cruising out of the Panama Canal. It was headed to a likely hydrothermal spot marked the year before by the Pleiades expedition. The target was about 640 kilometers (400 miles) west of Ecuador and 330 kilometers (250 miles) northeast of the Galápagos Islands. As it did for Project FAMOUS, the U.S. Navy had made detailed seafloor maps of the region using its powerful, top-secret SASS sonar. 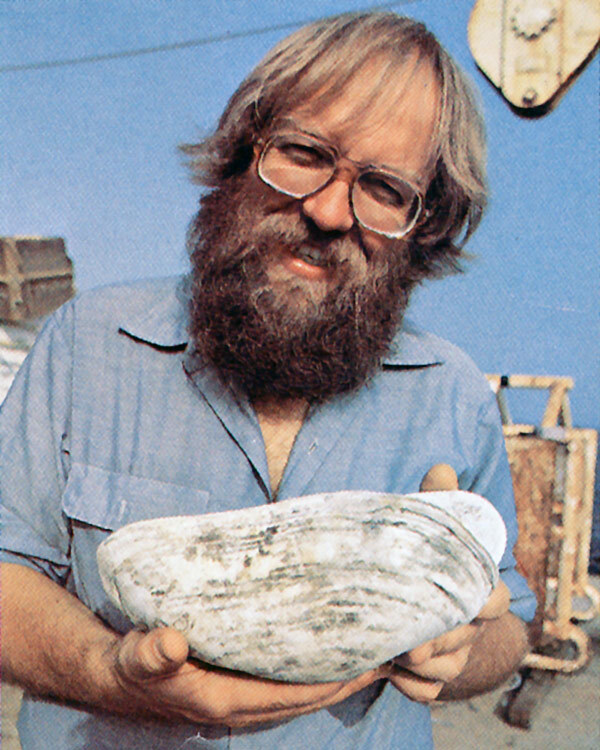 The expedition included Richard Von Herzen and Robert Ballard of Woods Hole, Jack Corliss, Jack Dymond, and Louis Gordon of Oregon State University, John Edmond and Tanya Atwater of the Massachusetts Institute of Technology, Tjeerd van Andel of Stanford, and Dave Williams of the U.S. Geological Survey. It was a team of top-notch geologists, geochemists, and geophysicists hunting for hydrothermal vents. No one imagined any need for a biologist on board. R/V Knorr arrived in the general area of the target site on Feb. 12. It lowered three transponders to the seafloor in a triangular pattern. 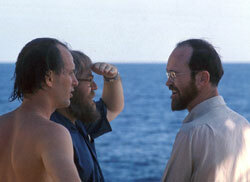 The three sound beacons would help track the positions of Alvin and ANGUS as they explored the seafloor. The scientists named the three transponders Sleepy, Dopey, and Bashful. 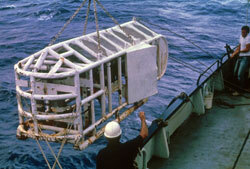 On Feb. 15, ANGUS (Acoustically Navigated Geophysical Underwater System) was lowered to the depths to scout the area. Built at Woods Hole for Project FAMOUS, ANGUS was a 2-ton steel cage. It was equipped with cameras and powerful strobe lights. It had a sensor that could detect water temperatures changes as small as 0.005°C. And it had acoustic transmitters that “talked” to the transponders so that the equipment could be navigated in the dark depths. As R/V Knorr fought a 1 1/2-knot current to stay over the target site, ANGUS cruised 2,500 meters (8,250 feet) below, taking a photograph every 10 seconds. 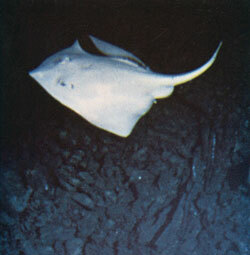 All through the evening of Feb. 15, scientists aboard R/V Knorr tracked ANGUS in the depths below. One person made sure ANGUS stayed at the right height above the seafloor, signaling the winch operator to pull in or let out cable as the seafloor terrain got higher or lower. Another person made sure R/V Knorr didn’t drift far from the target, signaling the bridge to adjust course as necessary. A third person watched the temperature readings of bottom water that ANGUS was passing through—hoping to see a spike that might mean the discovery of a hydrothermal vent. It was tiring and somewhat boring work. But then, at just about midnight, ANGUS sent out a signal. It had registered a spike in water temperature. The signal lasted three minutes, then water temperatures returned to a near-freezing 2°C (35.6°F). 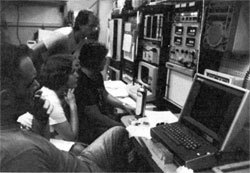 The scientists carefully noted the time and ANGUS’s position when the spike (called a “temperature anomaly” by scientists) occurred. ANGUS continued its mission through the night. After 12 hours, ANGUS ran out of film. 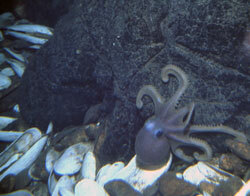 It had shot 3,000 color photos over 16 kilometers (7.25 miles) of seafloor. 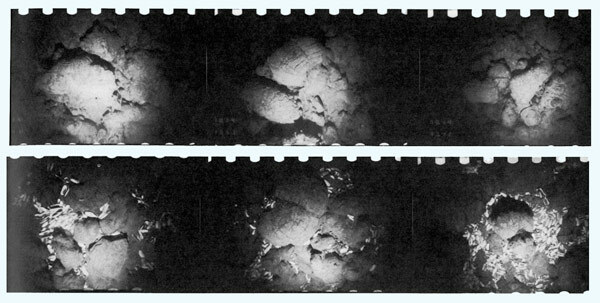 When the film was developed, the scientists studied the photos, starting from the first one. They looked at hundreds of photos, frame by frame, until they reached the photos that corresponded with the time when the temperature spike, or “anomaly,” occurred. Unlike the piles of empty clamshells found by the Pleiades expedition, these clams were clearly thriving. From inside Alvin	Jack Corliss makes his first observations of the Clambake area on Dive 713. From inside Alvin	Jack Corliss describes the scene at the Clambake area on Dive 713. From inside Alvin	Jack Corliss sees shimmering water on Dive 723. Within hours of the startling clam discovery, R/V Lulu with Alvin on board arrived on the scene. 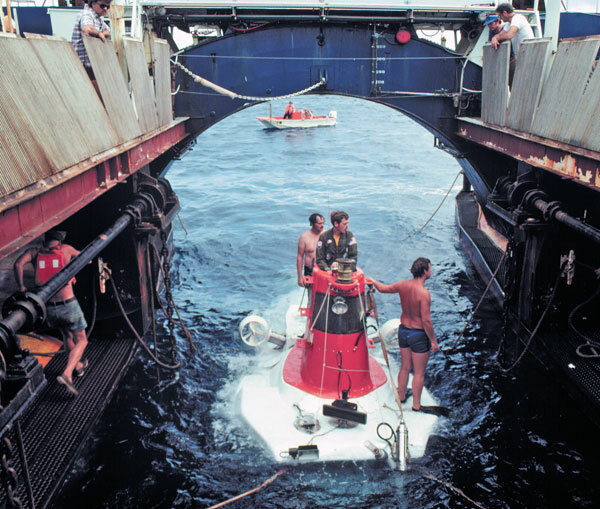 The Alvin technical team prepared the submersible, and scientists eagerly awaited the dive at sunrise the next morning—Feb. 17. It was Alvin dive No. 713. Jack Donnelly was the pilot. 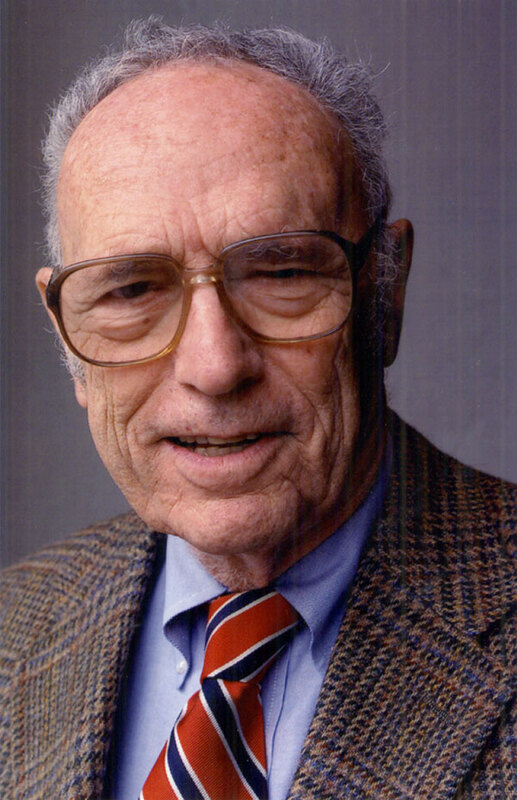 Jack Corliss and Tjeerd van Andel were the scientific observers. 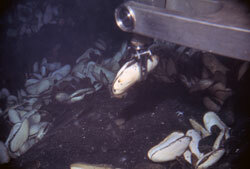 Alvin’s temperature sensors measured water temperatures of 8°C (46°F) at the bottom of the sea. 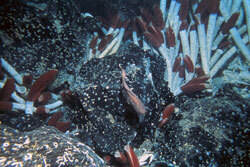 The first hydrothermal vent had been discovered. 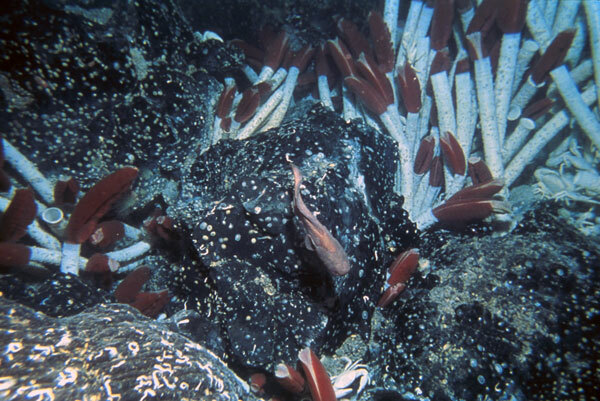 “But even more interesting was the presence of a dense biological community living in and around the hydrothermal vents,” Ballard wrote in Oceanus. White clams—up 30 centimeters (1 foot) long—clustered in an area about 50 meters (165 feet) across. Observing the scene from Alvin’s viewports, Corliss talked by acoustic telephone to his graduate student Debra Stakes, who was aboard R/V Lulu. From inside Alvin	Jack Corliss and John Edmond describe the red-tipped tubeworms on Dive 723. The scientists called the area that Corliss, van Andel, and Donnelly found “Clambake 1.” But later dives in Alvin discovered four other vent sites with other thriving communities of life. The scientists gave playful names to each one. Aside from the big white clams, “Clambake 1” had brown mussels, many white crabs, and a purple octopus, which probably preyed on other animals at the vent. Soon the scientists found “Clambake 2,” where all the clams were dead. This was thought to be the site found the year before by the Pleiades expedition. The “Dandelion Patch” had small, never-seen-before, orange animals that resembled—you guessed it—dandelions. The “Oyster Bed” vent site had no oysters (but, remember, geologists—not biologists—were doing the naming!). John Edmond sees shimmering water and measures its temperature on Dive 715. From inside Alvin	Jack Corliss sees “puffballs floating around” on Dive 713. The scientists on board R/V Knorr were astonished by the discovery of life thriving without sunlight on the seafloor. They were eager to figure out what the organisms were eating. “But we were not biologists. We were supposed to be finding warm water.” Ballard wrote in his book The Eternal Darkness. 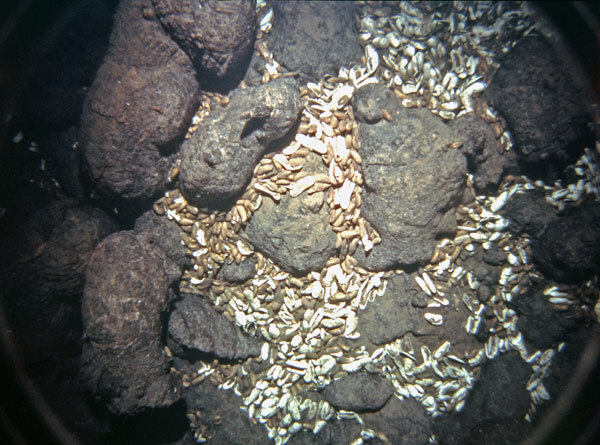 The scientists never imagined finding so much life on the seafloor, so they had no reason to stock the ship with lots of chemicals to preserve biological specimens. They stored specimens of clams and other seafloor animals retrieved by Alvin in a small amount of formaldehyde that one student had brought. Then they used the closest thing to formaldehyde that they had on board—some strong Russian vodka bought in Panama. But there was not nearly enough to preserve all the specimens. What were these newly discovered organisms feeding on? Water samples from the vents obtained by Alvin soon provided a powerful clue. As chemists drew the first water sample, the smell of rotten eggs filled the lab. Crew members and scientists rushed to open portholes. The water was full of hydrogen sulfide. From inside Alvin	John Edmond describes worm tubes and sea anemones during Dive 715. “A whole lot of things sort of fell into place,” said John Edmond, a geochemist from MIT, in Victoria Kaharl’s book Water Baby. “About halfway into the cruise, we realized that regular seawater was mixing with something. It was a unique solution I had never seen before. In the years since vents were discovered at Galápagos, scientists have determined that sulfate, which is abundant in seawater, is converted into hydrogen sulfide as the seawater circulates in the ocean crust. Bacteria and other microorganisms use the hydrogen sulfide in the hydrothermal fluids to live and grow. Higher organisms feed on these bacteria. This deep-sea food chain, which was unknown before 1977, does not require the energy or processes on which most life on Earth depended: sunlight and photosynthesis. Unlike the Apollo flight to the moon, the extraordinary Galápagos Hydrothermal Expedition was not watched by millions. 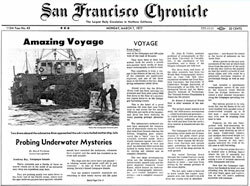 Only one newspaper reporter was aboard—David Perlman of the San Francisco Chronicle. He had a science journalist’s dream. 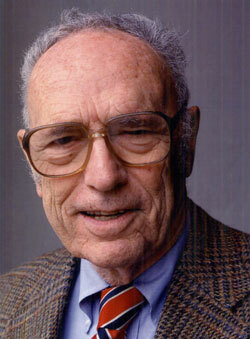 He “scooped” everyone else by publishing a series of exclusive stories on a scientific discovery that changed the world. “They have pinpointed geysers of hot water venting from fissures in fresh lava and sending warm plumes of brine shimmering upward into the near-freezing lower levels of the sea. “They have discovered fresh lava that was poured out onto the sea bottom in ropes and wrinkles, sheet-like pavements and bulbous pillows—squeezed or erupted from the hot, semi-molten material of the deep earth’s interior mantle beneath the crust. The headline for this article was “Astounding Undersea Discoveries.” Newspaper headlines can sometimes be sensational. This headline certainly was—but it was also absolutely true. Robert Ballard, from the Institute for Exploration in Mystic, CT, discusses finding the first hydrothermal vents with ANGUS during the 1977 expedition.